Technology plays a big role in our daily lives and learning. 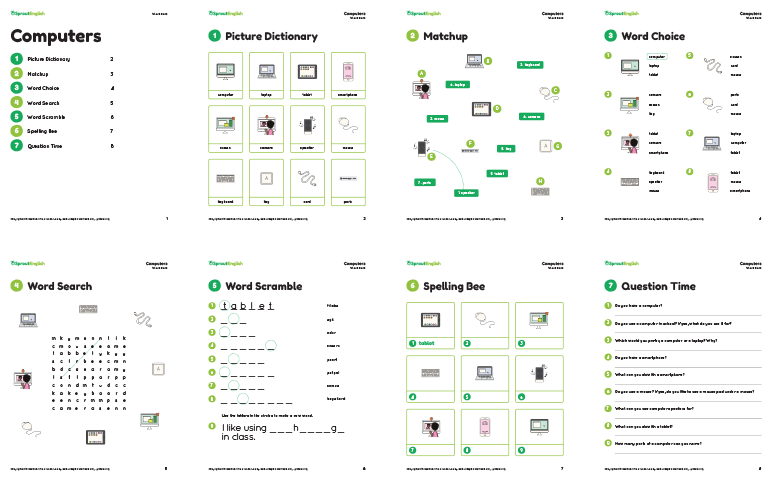 We’ve developed a NEW vocabulary lesson on Computers to help your young learners talk tech! In this Word Bank lesson, students will learn the names of common tech gadgets as well as the main parts of a computer. They will practice this vocabulary through several fun, colorful activities, including a picture dictionary, matchup, word choice, word search, word scramble, and spelling bee. This lesson finishes up with discussion questions so that your students can practice using the vocab in context. The images in this lesson are also available as flashcards at the end of the lesson. Try these 9 ways to use cards and flashcards in class. Find this lesson in the Word Bank - School & Jobs.